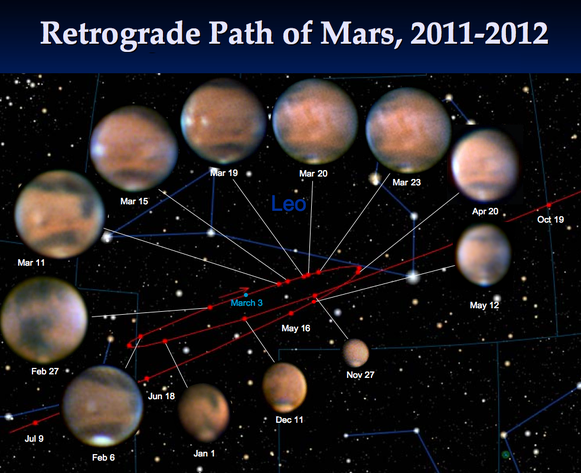 Mars, 2011-2012 Opposition - wa2guf's JimdoPage! May 11, 2012. Seeing was only average quality tonight. 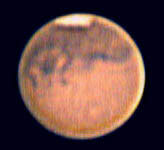 Mars is only 9" diameter, but still some surface details are visible in this image taken at 9:45 pm EDT (1:45 UT May 12). There is an interesting cloud at about 63°N on the meridian at 8° W. This location is over the northern abyssal plain between Mare Acidalium and the pole. Clouds also over Xanthe (right, near terminator) and Syrtis Major (left limb). Dark albedo features Mare Erythraeum and Sinus Sabeus are prominent as well as the lighter colored Margaritifer Planum region between them. This is where the rover Opportunity is now exploring Endeavor Crater. April 19, 2012. First opportunity to image Mars in quite a while. 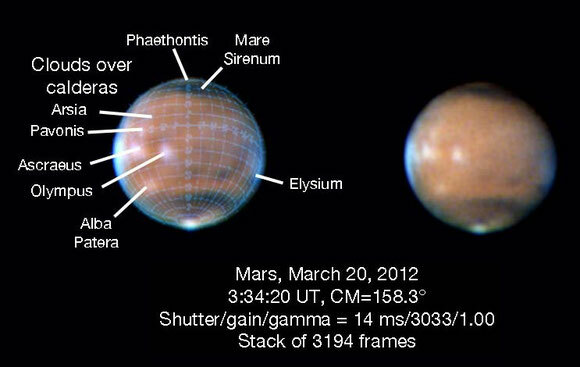 Mars is noticeably smaller and more gibbous than when I imaged it last month. Seeing was average to poor (very bad when the big jets go over). 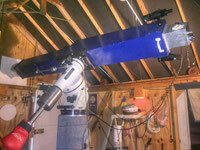 I used the Flea3 color webcam coupled to the 7.25" f/14 Schupmann with a 3x Barlow lens to give f/45. We see the Elysium region with a thin overcast blending into heavier cloud towards the western limb (right side). The dark area at the top is Terra Cimmeria and the dark region just above the NPC is the Propontis to Utopia albedo feature, part of the Boreal Abyssal Plain. Prominent clouds on the eastern limb are over the Olympus Mons volcano. The NPC is split into two distinct regions. March 22, 2012. I just got in from my first session with Mars tonight. 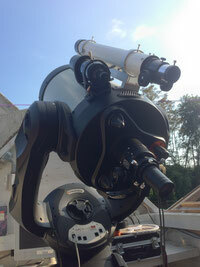 I started imaging around 10:18 pm EDT and took several videos. Something striking has happened. 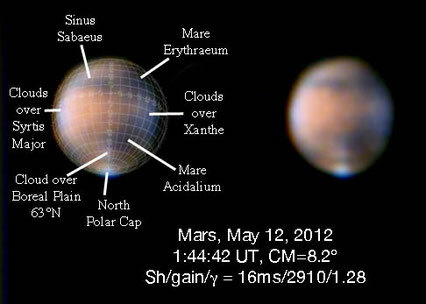 There is a diagonal band of clouds all across the face of Mars. I wonder if it could be related to the gray cloud reported by several imagers over the past several days? These clouds are completely different in appearance from the white orogenic water based clouds that have been regularly showing up around the ancient volcanos on the Tharsis ridge, Olympus Mons and others. One of my images is at the left. The location of the "limb projection" as it is being called now, is around the limb on the upper right. It will rotate onto the limb at around 12:35 EDT tonight. March 20, 2012. Clear sky chart shows excellent seeing just off the Jersey coast with good seeing inland. Viewing Mars with a 35mm Plossl/3x Barlow on the Schumpann gave the best resolution I have seen to date. The small cloud patch over Olympus Mons was almost starlike in appearance and very bright. 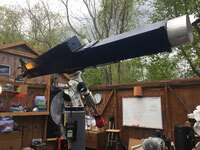 I replaced the eyepiece with the Flea3 color webcam and began taking 90 second videos. Several patches of cloud were present on the east and west limb as well as orogenic clouds over the calderas of the Tharsis ridge. I processed the videos with Registax6 and was a bit disappointed in the result. Seemed like I should see more detail. I went back to my old version 4 program and tried again and got significantly better results. See comparison below. An annotated version of the image from 3:34 UT is shown above. March 10, 2012. I set up the 7.25" f/14 Schupmann medial with 3x Barlow lens and Flea3 one-shot color webcam as Mars was approaching the meridian. Altitude was 60° and seeing was a bit above average, ~6 or 7 on the Pickering scale. Firecapture was used for video aquistion using the HQ Linear debayering algorithm as has been my recent usual practice. 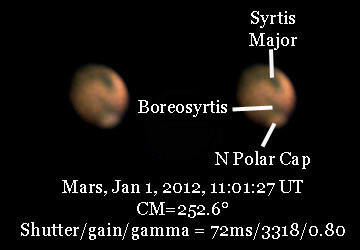 Many features of Mars were visible on the computer screen as the 60 second videos were taken. When processed by Registax6 and enlarged 2x in Photoshop many more details were discernible. The above image is typical. Note apparent division of N. polar cap into two pieces. The visible notch is unlikely to be Chasma Borale which should be oriented away from the earth at this time the video was taken. February 27, 2012. The above image was obtained with the Flea3 one-shot color camera coupled to the f/14, 7.25" Schupmann medial with a 3x Televue Barlow lens. A 60 second video was taken at an average frame rate of 55 fps and an exposure setting of 18 miliseconds. Gain was at 2889 and gamma was 1.0. The white balance was set at Blue/Red = 911/353. The video was processed in Registax6 and the final adjustments made in PhotoShop Elements. 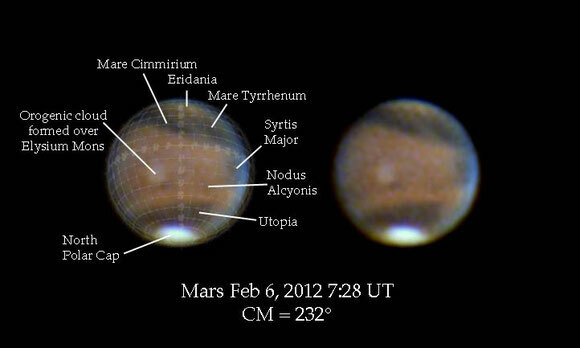 The 22° graticule superimposed on the left image was obtained from the BAA Mars section website ( http://www.britastro.org/mars/graticules.htm ). Although the resolution was poor, many features could be identified and are shown above. February 6, 2012. First opportunity to image Mars in quite a while. 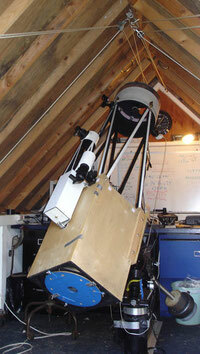 Sky was mostly clear, some haze and Clear Sky Chart prediction was for good seeing. 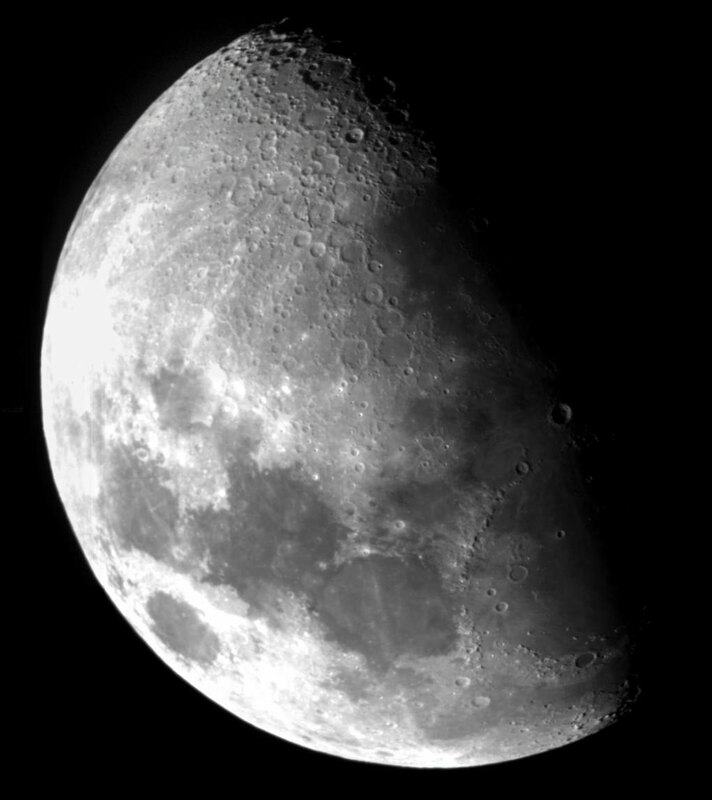 I set up the 7.25" f/14 Schupmann with a 3x Barlow giving f/46.4 and the Flea3 color webcam at about 1:45 AM EST and was taking my first video at 1:52. Seeing was pretty bad for a while, occasional flareups made the whole planet blur out of focus and get almost twice as big as it should be, but around 2:15 the seeing settled down considerably affording single frame views on the computer screen which showed a lot of detail. The above image was obtained from a 60 second video taken at 2:28 AM EDT (7:28 UT) using a shutter speed of 40 ms and a gain of 2768 and a gamma of 1.33. Processed in Registax6 and Photoshop Elements. Image is a stack of 700 frames, north is down. Central meridian at 232 degrees passing over the western edge of Elysium, diameter is 12.3 arc seconds. An orogenic cloud of water ice appears over Elysium Mons. A consideraby reduced north polar cap (compared to image of January 1) and several identifiable albedo features are present. The dark region above the polar cap is Utopia Plantia, location of Viking II and the dark area at the tip is Terra Cimmeria with Tyrrhenia Terra and Syrtis Major Planum just coming into view on the western limb. The tan area at the top is probably Eridania, a light colored desert feature on the old maps at about the same latitude as Hellas but further east. In the annotated image on the left is superimposed the 22 degree inclination BAA graticule. I shut down at 2:35 AM and noted the beginnings of dew formation on the objective. The skies were starting to haze over also. January 1, 2012. I started the new year off with my third attempt at Mars this apparition using the 7.25" Schupmann medial and the Flea3 color webcam. Seeing was only average, with a lot of difficulty focusing the tiny image and not very good transparency. I was using my 3x Barlow giving f/45. I had to use 72 ms exposure because of the haze and I did boost the blue level to try and get some improvement in the noise level of the blue channel. After processing a 90 second video, here is what Registax6 gives me. There are a couple of prominent albedo features present, notably Syrtis Major and Utopia with Mare Tyrrhenium vislble near the limb to the left of Syrtis Major. 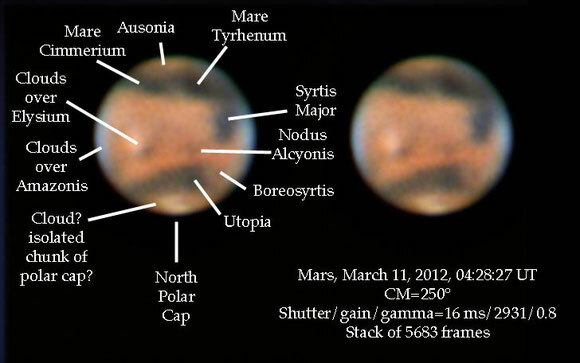 I hope to do better as Mars gets a bit closer. Note that the albedo feature Boreosyrtis extends all the way to Nodus Alcyonus. They seem to be merged together this year without the gap often seen. I believe some of the overlying light sand must have blown away, exposing more dark material normally covered by it. December 11, 2011. This morning we had clear skies in New Jersey and a prediction for good seeing. 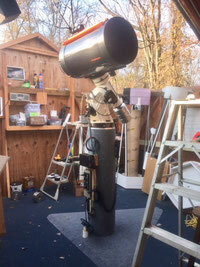 I set up the 7.25" Schupmann with a 3x Barlow and the Flea3 one-shot color webcam and lined up on Mars. Between 4:58 and 5:10 am I took seven 90 second videos. 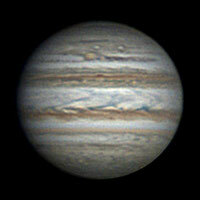 After processing them, the sharpest image was obtained from the video taken at 5:07 EDT (10:07 UT). Besides the prominent North Polar Cap, several albedo features were identifiable. These are indicated in the image to the right. South is up in this image. 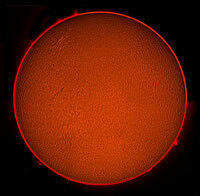 The longitude of the central meridian at the time this image was taken (0932 UT) was 77.6 degrees. Only the western edge of Mare Erythraeum is visible. Most of the dark feature at the top is Solis Lacus with a darker northern border than is usually seen. This border is actually Valles Marineris. 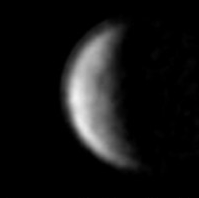 The large dark smudge on the left side, just below center is Mare Acidalium, and the dark border region south of the North polar cap is Mare Borealis once thought to result from water draining off the melting polar ice cap and supporting the growth of vegetation. Both Mare Acidalium and Borealis are actually just darker albedo features in the northern boreal plain which includes the Cydonia region containing the so-called "Face of Mars". The light spot above the right side of Mare Borealis may be water clouds over Alba Patera, a volcano comparable in extent, but not as high as Olymupus Mons which is lost in the general glare of the Tharsis region. I find it remarkable that this much detail is visible this early in the opposition season. 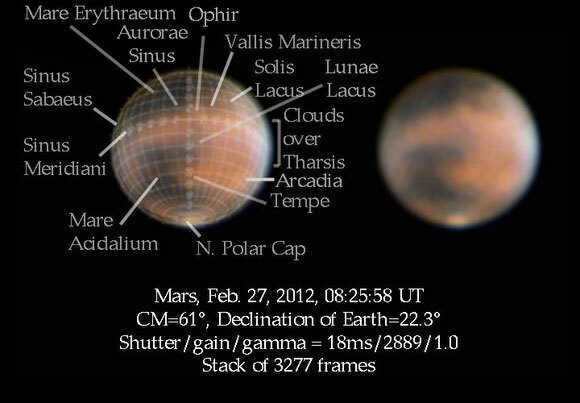 Note that the disk of Mars is only 7.6 seconds of arc in diameter at this time. 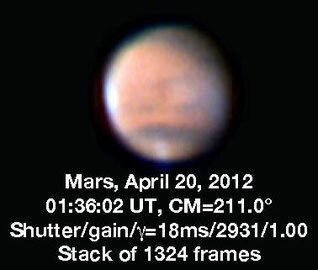 It will only get to be about 13.9 sec around opposition on March 3, 2012. Thanks to Mike Brown for improving the channel alignment and color balance of an earlier version of this image. November 27, 2011. 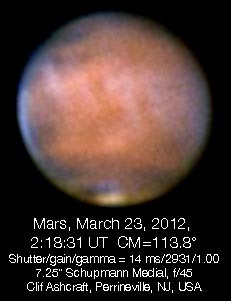 The sky was clear and Mars high in the sky when I got up at 4 am this morning so I headed out back to the observatory and took a couple of 90 second videos of Mars with the Flea3 one-shot color webcam coupled to the 7.27" f/14 Schupmann medial with a 3x Barlow lens. I used Firecapture to take the video with live debayering using the Edge algorithm and an exposure of 11 ms. a frame rate of 90 fps was achieved. Videos were processed with Registax6. The image shown here is a stack of the best 829 frames out of a total of 8280 frames on the video. 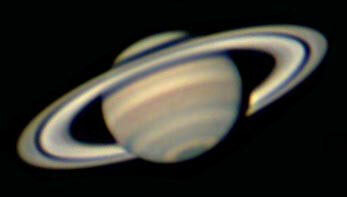 Levels were adjusted in Photoshop and the imaged magnified 2x for easier viewing. 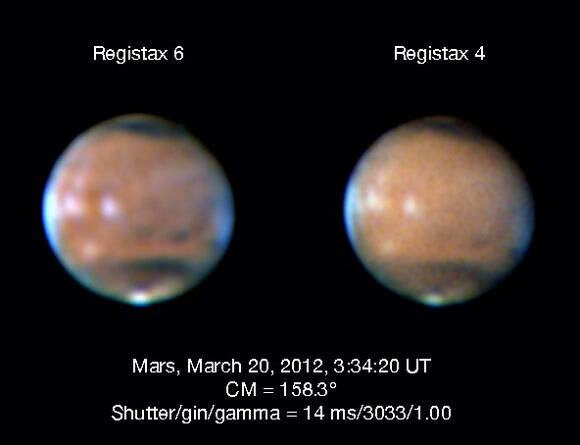 This is my first Mars image of the current opposition season. 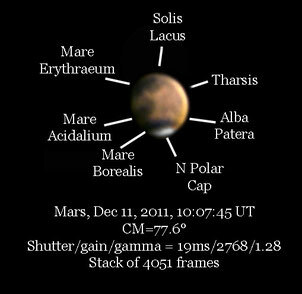 The image was tiny, even at f/45, because Mars is still quite distant and only 6.9 sec arc in diameter. 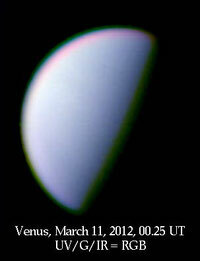 Just after opposition on March 5, 2012 it will be 14 arc sec in diameter at its closest approach of 62.6 million miles. The northern polar cap is visible with a dark border. I believe the darkish area at the top (south) is Mare Cimmerium. The longitude of the central meridian at the time this image was taken (0932 UT) was 203 degrees.